As the eighteenth century dawned on Europe, the pottery makers of Staffordshire, a county in west-central England, began to discover new glazes that made their products more attractive and durable than ever before. Blessed with a natural abundance of clay for molds and coal to fuel the kilns, Staffordshire�s pottery business quickly gained international renown. 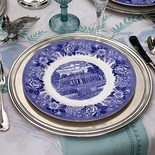 By the mid 1700�s Staffordshire ware had begun to reach American shores, and over the next century, the new republic became a major market for English pottery � from fine bone china to transfer-printed creamware and cheap clay pots. 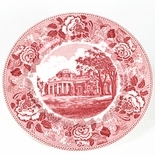 Archaeological excavations at Monticello, have unearthed a number of Staffordshire pieces that date to Jefferson�s lifetime. 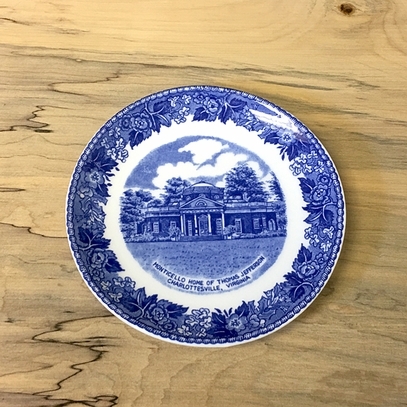 Shards of plates, cups, and saucers made of creamware, the dominant English ceramic on the market by the 1760�s, were excavated from the Dry Well, and Mulberry Row, Monticello�s center of light industry. Also unearthed from the Dry Well was a drinking tankard of white salt-glazed stoneware, a tableware common in American between 1740 and 1770. 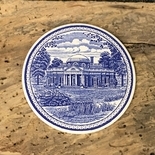 Use our Staffordshire coaster to hold rings, guest soap, or as a decorative accent. 4 �� diameter. Made exclusively for Monticello.